Rajasthan is synonymous with extravagance – The land of illustrious Rajput kings famed for their royal culture, glorious past and magnificent palaces. Travelling in the luxury trains of Rajasthan, you get a chance to indulge yourself in the royal & extravagant lifestyle that was enjoyed by nobility of the bygone era. These trains have inherited the legacy and heritage of Rajasthan. Journey in these luxury trains offer unique and exclusive experiences for a traveller to explore Rajasthan beyond the regular sightseeing. The days spent on these trains breeze past comfortably as you not only get to experience the royal treatment but also enjoy mouth-savouring authentic Rajasthani dishes and international food. 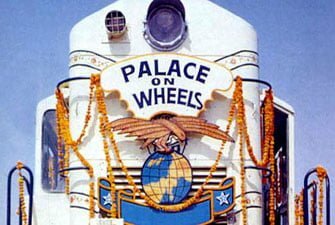 Palace on Wheels, a luxury train introduced back in 1982 has been voted as world’s best Luxury Train in Rajasthan numerous times. Over 7-8 days, the train covers Taj Mahal in Agra, Hawa Mahal, Amer Fort and Jantar Mantar in Jaipur, Sonargarh Fort, Nathmalii ki Haveli, Salim Singh ki Haveli and Patwon ki Haveli in Jaisalmer. Umaid Bhawan Palace, Mehrangarh Fort and Jaswant Thada in Jodhpur. RanthamBore National Park in Sawai Madhopur. Shikarbadi, Lake Pichola, Sahelion ki Baari, Fateh Prakash, and City Palace Complex in Udaipur, Chitorgarh Fort in Chitorgarh, Keoladeo National Park in Bharatpur. 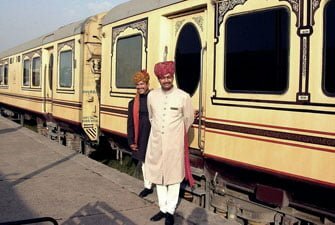 Apart from Palace on Wheels, Rajasthan now has an array of luxurious tourist trains that offer extravagant journeys across select destinations and regions for an enchanting Indian holiday. We are pleased to offer a complimentary 1-night hotel accommodation in Delhi with airport transfers in a midsize air-conditioned car on arrival and Departure as per your requirement. Enjoy an unforgettable experience of travelling in any of the following luxury trains in Rajasthan with State Express- a trusted name in Indian Tourism.